This is the best cattle mineral trough made. Any size of small scooter tire will work fine. If it has tread worn smooth, that is OK. If you don't have a scooter, go by a Honda dealership and take a few old tires out of their dumpster. If none are in the dumpster ask them to save some for you. You won't need many -- they last forever, so don't worry about replacements. Cut one rim of the scooter tire off with a Sawzall or utility knife to make a larger top opening. Turn it wrong side out (This takes some muscle) or just leave the tread on the outside. 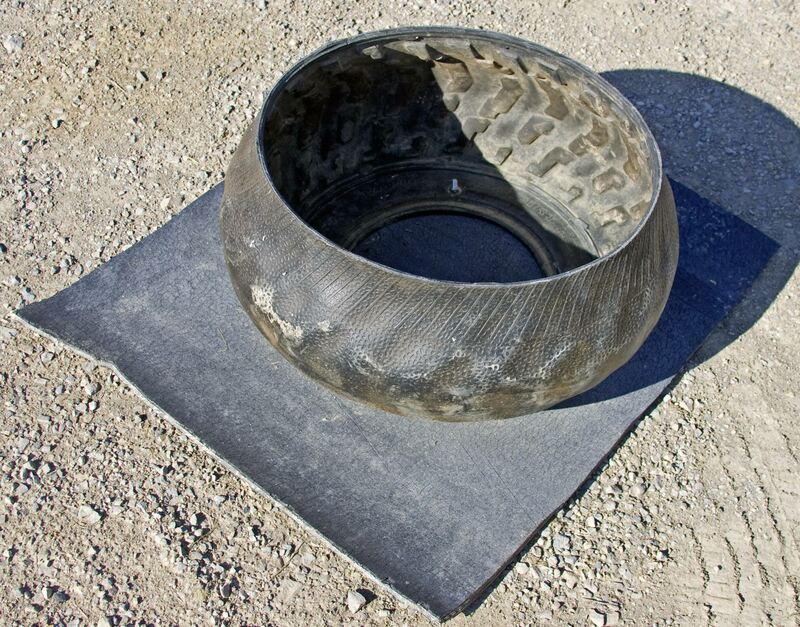 Bolt the belting or plywood to the bottom section of the tire. Even the herd sire or the grand kids can't tear it up. People who successfully breed and raise quality cattle have a good mineral program. The mineral is carefully formulated and fed in an efficient manner. Quality minerals are costly and should be fed in a minimally wasteful way. Every area has different soil deficiencies. Testing the minerals in the soil, water and fibers is the only perfect way to know. If testing isn't possible ask the oldest successful rancher in the area what to use and that will be okay if he gets a 95% calf crop. Some veterinarians are on top of it and offer wise considerations. Normally under 20% salt is best. Mineral manufacturers tend to use ingredients that are economical and salt is cheap. Don't use salt blocks as they have under 1% actual minerals. Cattle will grow better and be healthier if they have correct minerals. That includes growing more horn by using a balanced mineral to fit your area. Don't be surprised if your soil is lacking selenium, copper, cobalt, iodine, zinc and other high priced trace minerals. A custom designed mineral, to correct the deficiency of the soil, will cost over $1000 per ton. A cow should consume about 2 -+ ounces per day. Valuable minerals will turn into a rock when allowed to get wet, then dry out, causing the chemistry to deteriorate. Years ago loose minerals were fed in bath tubs, home made steel containers, cutoff barrels and every type of available design. Some build different shaped wood troughs or perhaps buy a high dollar plastic unit that hangs from a tree, looking like part of something stolen from a Burger King play place. Some build wood troughs with gazebo type hip roofed covers large enough to require transport with a front end loader or tractor to drag them on sled runners. A half metal barrel with the round bottom down is the most famous. Barrels have been used by the millions for loose trace mineral feeders. Some people weld old steel posts or scrap pipe in a cross formation under the barrel to keep bulls from turning them over. After all the different home made el-cheap'os and the high dollar plastic store-bought disintegrating types, this is the way to make a real mineral trough that won't rust, is economical and lasts forever. A grand kid can run over it with the ranch truck and not break it or mess-up a tire -- in fact may not even know when they drove over it! The bottom side shows 4 little bolts with a 2 foot square rubber belting attached. If free belting isn't available, use heavy treated plywood the same size. 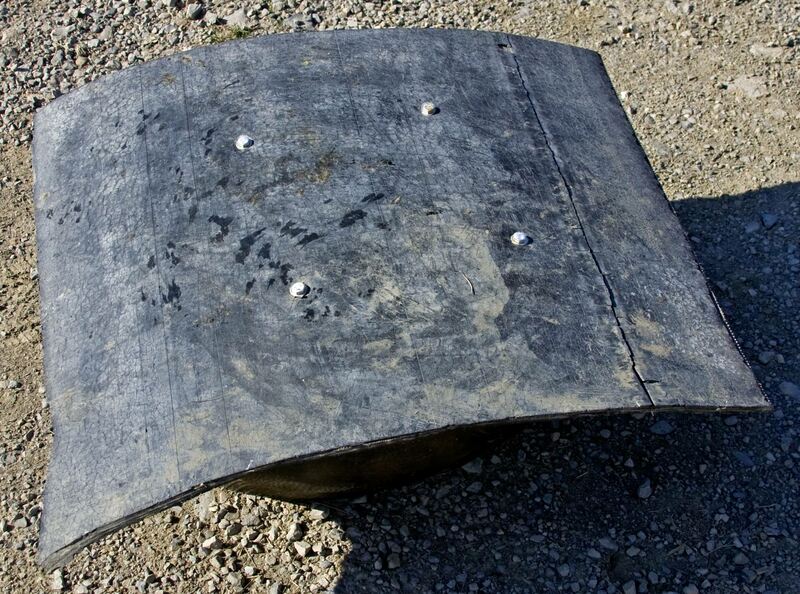 Parts include a worn-out scooter tire, four or five small stainless steel bolts with fender washers and an old piece of two foot square rubber conveyor belt. If no conveyor belt is available take a 4' X 8' sheet of treated plywood and cut it into 8 pieces. The old rubber belting lasts longer, but the plywood is good for about a dozen years. The top opening is small so it doesn't catch a lot of rain water. If you live in a rainy area, only add a few days supply of mineral at a time. Let the cattle clean it up before adding new mineral. Keep the mineral fresh. If the herd bull has too much fun pushing the trough around, drive a steel re-bar or two through the corners and nail it to the ground where you want it to stay. If it appears so valuable the neighbors start "borrowing" them, slap your hot iron brand on the side. Don't put an ADT 840 compliant tag on it -- the cattle rustlers love to remove those.